Season 2 of this cyberpunk anime thriller is off to a tame, but promising, start. Guns that only fire at the guilty, a huge system that judges people's emotional stability and benefit to the city, and one person who has to live with a truth that would destroy society. Psycho-Pass ended strong and left us with some questions as to what would happen next. The first episode of Psycho-Pass 2 doesn't do a lot in its first 20 minutes, but it could build up to a big takedown of systems of power. 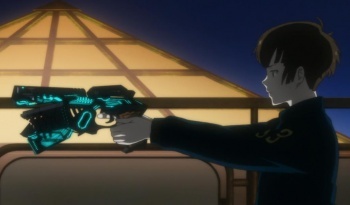 Psycho-Pass season 2 sets up what will hopefully be an extension of themes from the first season two years ago. Jumping right into a new conflict, main protagonist Akane Tsunemori, still an inspector at the Public Safety Bureau, brings an optimism not often seen right from the start of cyberpunk. 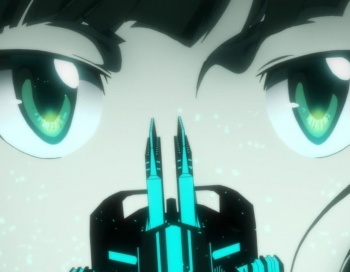 The first season of Psycho-Pass set up the premise for an advanced city-state that can pinpoint the members of society who do not benefit the system as determined by the Sibyl System. Thanks to Sibyl, police don't have to do traditional detective work, but instead rely on the "Psycho-Pass" of individuals that determines their probability of committing a crime based on that person's mental state, actions, and motivations (or "crime coefficient"). An advanced gun called the Dominator works with Sibyl and won't unlock its safety unless it's pointed at someone with a high enough crime coefficient. Even people who have not committed a crime yet can be taken in for therapy for a cloudy Psycho-Pass to protect the residents of the city from harm. When the Public Safety Bureau encounters a criminal who falls outside of Sibyl's judgment, newcomer inspector Akane Tsunemori discovers the truth behind the system condemning people for crimes they could commit and assigning people work placements based on their mental state and aptitudes. Akane firmly disagrees with the system but realizes the people of the city rely on it. One and a half years later, Akane is leading her division of the Public Safety Bureau with Mika Shimotsuki, who joined in Psycho-Pass's first season finale bookend. Mika doesn't know the true form of Sibyl nor does she approve of Akane's way of doing things. Akane treats enforcers, the "dogs" of the bureau with higher crime coefficients, as equals, and they work with her unquestioningly not because she's their superior but because they trust in her individual sense of justice. With Mika questioning each of Akane's decisions in this first episode, it's clear the relationship between two will be a point of tension in this season.